We continue on with the William Stringfellow Project, where I read all of William Stringfellow's books in chronological order in their first editions. See the sidebar for installments. In this post we turn to the sixth book Stringfellow published, Count It All Joy. 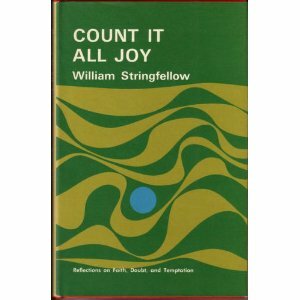 William Stringfellow, a Christian without comfort, gives us, beyond all expectations, the only comfort worth having. He gives us the truth. We are not entirely grateful--and far from easy--at the gift he lodges in our hands. How could we be? We are grown weirdly resigned to the mindless exploits of those whose theology is an empty exercise in childishness, and to the heartless exploits of those who justify death as a way of life. For a new mind and a new heart, explored with new words, we are grateful to this innocent and troubling man. Saint James could have had no more exact and articulate spokesman. Readers will we recall that Berrigan was arrested for the Catonsville Nine protest in 1967--the year Count It All Joy was published--at William Stringfellow's house. Quite a year for the two of them. As Berrigan notes, Count It All Joy is a book inspired by the Epistle of James in the New Testament. Many of the themes of the book are common to Stringfellow, themes we've already encountered in his earlier books. So for this book I'd like to focus on a theme in Stringfellow that I haven't yet given much attention to--the place of the bible in Stringfellow's thought. Stringfellow is an odd duck in many ways. On the one hand he's a liberal Episcopalian. And yet, Stringfellow has this very high view of the bible as a location of Divine agency, something you don't see a whole lot among liberal Episcopalians or other mainline Protestants. To be clear, Stringfellow is no fundamentalist. He's not reading the bible literally. I'd characterize Stringfellow's reading of the bible as pneumatological, where the bible is a location of God's Spirit encountering us in the midst of death. (Note: Though I've used the word pneumatological Stringfellow would say "Word of God" rather than Holy Spirit in describing all this.) Thus, Stringfellow encourages us to read the bible--a lot--and listen for and wait upon the Word of God. Listening...is a primitive act of love, in which a person gives himself or herself to another's word, making ourselves accessible and vulnerable to that word. It is very much like that when a person comes to the Bible. We must first of all listen to the Word which the Bible speaks, putting aside, for the time being, such other issues as whether the Word is credible or congenial or consistent or significant. By all means, if you will, raise these questions, but, first, listen to the Word. Some will think this a naive approach to the Word of God in the Bible. I suppose it is just that. It is one which simply affirms that the Word of God has content, integrity and life which belongs to God Himself and that this can be received and comprehended by ordinary human beings. It is a view that regards the Bible more as a newspaper than as a systematic body of theological doctrine or as religious instruction or as moral law or, for that matter, as mere esoteric mythology. The Bible reports the news of the Word of God manifest and militant in the events of this history in a way that is accessible, lucid and edifying for the common reader. The Word of God is for us, and through the Bible that Word is addressed to us where we are, just as we are, in this world. All that happened, and all that was allowed, in the brief sessions of the "class" following that first Sunday, was that I read, aloud, the entire Letter to the Romans. Stringfellow allowed no interruptions or questions. He just read Romans aloud. Predictably, the class rebelled--for example, a boy created a disturbance by bringing a case of beer to class--but Stringfellow patiently persisted. [T]he essential event each week remained the same--all of us simply heard a reading of the entire Letter to the Romans. It was only after the group had suffered this exercise a dozen or more times, week after week, that the tactic was changed and I proposed that the Letter be then read sentence by sentence, in its given sequence, and that after reading each sentence aloud, we all pause and ask one question: What does this say? Not, what do I think? Not, do I agree? Not, is this relevant to my life and circumstances? But, straightforwardly, first of all, What is this word? So we persevered. It was a laborious enterprise. But we did continue, meeting each Sunday, and, as it were, reading and listening to each sentence of Romans, in turn, and asking, What is being said? Silence--utter, unequivocal, radical, dumbfounded silence--greeted this practice for weeks. But I insisted upon it and the members of the "class" acquiesced in it, as much out of bemusement at this unorthodox "Sunday School" as anything, I suppose. It was around Christmastime that the change came. The same boy who had brought the case of beer to "class" turned up one afternoon at my tenement in East Harlem. He was, it seemed to me, embarrassed to appear to have deliberately come to visit me, belabored a number of excuses for dropping in. Finally, after his protracted and circumloquacious introit, he mentioned that he had obtained a copy of the New Testament (he had stolen it, he boasted, from the premises of some other church) and confessed that he had been listening in "class," though he had not spoken out there, during all the weeks in which Romans had been repeatedly read aloud. He thought, he said, that I must have plenty of other things to do and would not bother to take time for this "class" or persist in reading the Letter in "class" unless I was convinced there was something important in the Letter. His curiosity was engaged and he had procured a New Testament, he admitted, in order to read the Letter on his own in his privacy. He had now some reflections about his own comprehension of Romans that he wanted to discuss because he had wondered if my own understanding of the Letter corresponded with his. For the remainder of the afternoon he and I tried to talk with one another about our respective experiences of hearing the Word of God in and through the Letter of Romans. This tough, brash, aggressive kid from the streets turned out, in that encounter, to be a most sophisticated exegete, although I am pretty sure that if I ever called him such to his face his impulse would be to hit me for cussing him. Somehow it had lingered in his conscience that the original, indispensable and characteristic question to ask, in reading the Bible, is the very question that seems so seldom to be asked in church or seminary or layman's conferences, namely, What does this say? Somehow, thus, he had come, reluctantly, against his will, with his customary hostility and suspicion, to confront the Word of God in the Bible in a way very similar to that which he would face another person. Among the gifts of that afternoon with this most remarkable exegete was the illuminating candor of our relationship. Now, for the first time, we met, under the aegis of the Word, in a new way. Now we were set free from from the roles consigned to each of us or adopted by either of us in the prior contacts in "class." We were no longer restricted by differences of education or learning or race or age or class or whatnot. Now, by the virtue and initiative of the Word of God, bespoken and attended to in our respective experiences in the Letter to the Romans, each of us became at liberty not only to praise the integrity of the Word of God but to be accused and convicted in our own identities as individuals. It was, in that afternoon, not just that the Word of God was, as it were, recognized as a name, but that each of us also were named ourselves in the very same happening. Now the Word of God, in the testimony of Romans, had become evident as the event in which each of us were certainly and fully our selves (cf. James 1:18; 1:21). Part of the wonder of the occasion was and is that when and wherever the Word of God is heard and honored, human life acquires context, people are radically distinguished and identified, community is wrought, and reconciliation happens. All that might be a bit of a stretch for those of us who have issues with the bible. Regardless, it gives you a sense of how Stringfellow sees the bible and how he views the reading of the bible. This passage in Count It All Joy shows how, for Stringfellow, the the Word of God becomes active in our lives--a location of Divine agency--when we listen and ask "What does this say?" I have to ask - where does this whole "mainline Christians don't read the Bible/take the Bible seriously" idea come from? Rachel Held Evans had something about that a few months back as well. I'm ELCA Lutheran (very mainline) and we get four scripture readings every service (in a lectionary cycle), a sermon that it an exegesis of that scripture, and at least one Bible study group going, more if the church is larger. My church gave us all free Bibles when we were 8 and we read straight from it in Sunday School. After an initiative to increase Bible reading even more, the newest Sunday School program actually has the children follow the lectionary. And I'm under the impression that we are NOT exceptional - that Methodists, Presbyterians, the UCC, and Episcopalians also use scripture as much as we do and encourage Bible study. They certainly have at the churches I've visited. So this idea that somehow Evangelical = read the Bible and take it seriously, while mainline = never read your Bible, is baloney. Please stop spreading it. liberal Episcopalians or other mainline Protestants." The issue I'm speaking to is Divine agency, something a bit more charismatic than what your are talking about (e.g., never reading your bible). As for why I make that comment about Divine agency. First, it's Stringfellow's own assessment of Episcopalians. Second, this summer I heard Walter Brueggemann (who is mainline) make this exact observation. That is, while mainline Protestants do "take the bible seriously" they need to recover a sense of Divine agency about the reading of the bible. The point being, when mainliners themselves are making these assessments I feel free to share them as self-assessments coming from insiders from the mainline tradition. But, then again, all traditions are very diverse, denominationally, congregationally and individually. You just inadvertently hit a nerve is all. In your experience, do non-mainliners take a more "pneumatological" approach to Scripture? The closes I've heard to this kind of practice was actually from a Catholic (reading, meditation, prayer, contemplation). I can understand being very sensitive to the "don't take the Bible seriously" concept, whether its actually been used, or just perceived to have been used. It seems to be the default ad hominem from the inerrantist/fundamentalist/evangelical types whenever a topic is being discussed that doesn't fit conservative theology, like equality for gays and egalitarian marriages. It gets tiring very quickly when you have that throw at you repeatedly. No worries. I need to be careful about painting with broad brushes. I was mainly trying to communicate in those lines Stringfellow's own assessment that he approached the bible differently from his fellow Episcopalians. marrow; it judges the thoughts and attitudes of the heart." (Heb. 4.12). Passages like these are regular fare in these churches, encouraging members to carry bibles and quote scripture in daily life as a form of experiencing Divine agency in the world, mainly as a means for spiritual warfare. re: divine agency and how we read scripture. God may or may not be speaking/acting through scripture. Either way our experience of God's agency doesn't determine the fact of God's agency. ie: I may swear all day long that I heard a word from God, but I could be wrong. I could be hallucinating. I could be lying. Oppositely, I may believe God has never spoken or acted in my life or doesn't even exist, but I could be wrong/lying etc... So I don't think that we necessarily need to hold a particular attitude toward scripture or idealize a particular experience of scripture as more or less expressive of God's agency. That's sort of up to God. She either is acting or isn't. What I do think is significant with any text (and by text here I could equally mean work of art, or even other person), is that our ability to learn from it and be transformed by it is conditional upon its strangeness, its otherness. What I think Stringfellow accomplished with these kids is making the Bible weird again. Similar to how if you repeat a word long enough it ceases to sound like a real word and becomes nonsense. He read Romans over and over again until it no longer sounded boring and familiar. Till it no longer sounded like the same stuff you hear in worship and Sunday School all the time. Once it became strange to these kids it was possible for it to also act on them in a transformative way. This can be done in a variety of ways. For example, I think the Historical Critical Method is a great way to make the bible weird to people again. I use it a lot as a pastor in my teaching and preaching. Conversely I think a lot of people who have a supposedly "high" view of scripture actually domesticate the Bible. I think using the bible for spiritual warfare can be just a way of making the Bible a tool and never really hearing it at all. Some atheists who read the Bible get more from it than most Christians who can't read it without hearing a million sermons in their head. The method isn't the key, nor is the doctrine of inspiration you hold. It's all about recognizing how weird it is. Thanks for this. I love the whole idea of "weirding the Bible" to facilitate a potentially transforming encounter. That is probably a better angle at this idea of Divine agency. It's not, as you note, that God is or is not doing something, but more the notion that God is free, an "agent" independent of us, the blowing, untamed Spirit who is outside of our sphere of influence, control and comfort. Because once the Bible is owned and mastered--a possession of the in-group--in that moment it becomes an idol, a mirror of the in-group who are transfixed by their own narcissistic gaze. Really neat Stringfellow stuff, and thanks for the post. One irony here: the 'pneumatological' approach that you describe actually all sounds very instrumental, and not at all what I think of as being of the Spirit. Some people imagine that they can make the Almighty into a sword that they wield, when I often experience Scripture as something wielded against all of us, our preconceptions, and our hubris at thinking we can master it. Like aricclark said, it is weird. Too weird to slip in your scabbard and swing it around. When you use it as a stick to hit people, it turns into a snake in your hands. It unfolds in strange, surprising, terrifying and delightful ways, like a conversation with God would, if there is a God. I'm not quibbling with your word choice here. Just letting an inversion of it play out. I think it worth nothing that taking the Bible literally and taking it seriously are two different things. I'm Episcopalian, and while very few of my fellow parishioners take the Bible literally, they do take it very seriously indeed, our clergy even more so. That someone like Stringfellow would emerge from my church is no surprise to me. This is a great post. I have actually been doing alot of thinking about the doctrine of scripture found among dialectical theologians. Richard I recommend you read Karl Barth's "Epistle to the Romans" , i'm reading it right now , and that book has you all over it! Also Church Dogmatics 1.1 is a good way to learn more about Stringfellows doctrine of scripture. The notion of weirding Scripture is beautiful. Tangentially related, because a one-line post feels like bad form: Eugene Peterson wrote The Message for two groups of people: ones who thought they couldn't understand the Bible, and ones who thought they already did. I'm an Episcopalian who loves Stringfellow and what he is saying here. I don't think anyone is being insensitive or painting with a broad brush. I know Episcopalians who have little to no use for the Bible -- because they've told me so. It upsets me, and it also fits the stereotype some people like to toss around about us.